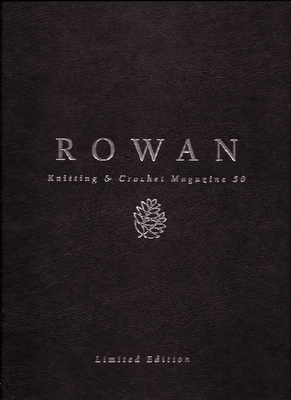 Recently my copy of Rowan 50 magazine showed up in my mailbox and it's a winner! I was lucky enough to receive the hardcover version as I subscribe to Rowan International, something I've done since it began. The scan shows the cover to be black and silver. The colors are actually brown and gold. Rowan yarns is my all-time favorite, if-I-had-to-choose-only-one, yarn company. I admit that I like the earlier yarns and patterns better than some of the recent offerings. 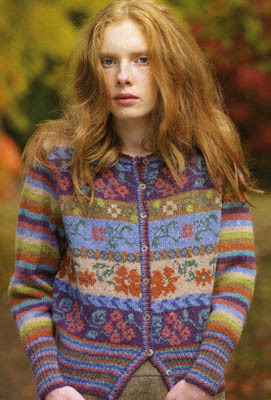 With Rowan 50 there is a return to some of the more classic designs. After spending time and money, I like to think that the resulting garment is something that I'll still want to wear in the future. There are several in this magazine that fall into that category. I particularly like "Maple" by Marie Wallin, knitted in Felted Tweed (page 12). I love color and this design blends ten shades beautifully. You have to see all the pictures in the book to fully appreicate the design. If I didn't have so many other sweaters already planned and sitting, waiting patiently, in my stash, I think I'd probably be casting on for this one soon. However, given that Rowan discontinues their yarns and colors so often (a pet peeve of mine), maybe I should stash the yarn for this one, too. Rowan magazines are also for reading and there are articles about designers, Shetland Lace, a Travel Journal, and more. Of course, there are also some designs that make me ask "what were they thinking?" Do you have a knitting "bucket list"? I do, and near the top of the list is the wish to have a design in a Rowan magazine. I don't know if it will ever happen, but you never know. Check out the future Rowan 100 and see if you can find my name in it! !